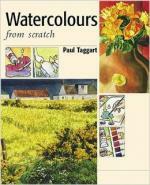 Through his unique Artstrips©,Paul Taggart is able to impart detailed instructions on materials and demonstrate the most basic of techniques, as well as those that can only be passed on visually. When combined with exercises and stage-by-stage compositions these amount to substantial tutorials. Tutorials demonstrate what can be achieved with a basic kit of six paints, a few brushes, and a palette and watercolour paper. 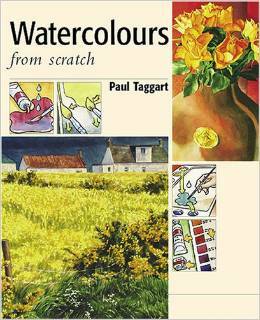 A successful introduction to watercolour painting can only be achieved through understanding the basics of these materials, putting them into practice and exploiting their characteristics. Discover how scuffs and scumbles on a textured surface help to establish the rhythms of a lively landscape. Learn to exploit subtle and powerful mixes of colour to achieve the contrast and vibrancy of a vase full of flowers. Observe how a beached boat on still waters relies on brush-strokes to capture reflections in the water and patterns on the shoreline. Note the play of light across a wild holly tree – attained through exploiting the transparency of watercolour paints. Which Paints Do I Need? Many painters are not able to get the proper advice early on and consequently find themselves with inappropriate paints. Why Do I Need A Brush? I return to basics and look at what the most common shapes do best, what the brushes should be made of and why. This simple piece of equipment is as important a tool as brushes and paints and when fully exploited will definitely enrich any painting experience. What is so special about a painting surface? Should the wrong surface be used, no matter how well the techniques of painting have been mastered, the artist will run into trouble. Why Do Pastels come in a Range of Tints? Working with this dry medium relies on the ability to exploit and manipulate a range of tints to effect the full range of values required to express the nature of light, volume and depth. Why should I bother with colour mixing? Colour mixing is every bit as important in making a composition work as perspective or drawing. With colour control you can communicate with the viewer, tell a story or evoke a mood – hence the phrase ‘to paint a picture’.